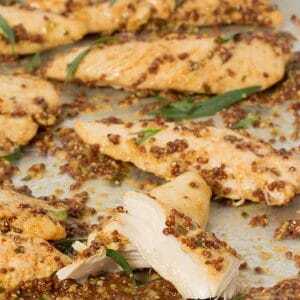 This Mustard Baked Chicken Tenders recipe is super simple and deliciously spicy. The mustard sauce is perfect over rice or a salad. Combine all ingredients, except chicken tenders, in a large bowl and mix well. Add chicken and mix to coat with the mustard sauce. Place chicken and sauce into a large baking dish and cover. Bake until chicken has cooked through, 15 to 20 minutes. To check the doneness of the chicken tenders, cut one halfway through. If the juices are clear and the meat looks done, it’s ready.